After a two year design and construction period the MEEC furnace has been completed in the autumn of 2007. The furnace has inner dimensions of 1500 x 1500 x 1850 mm (length x width x height). The insulation consists of three layers of ceramic fire bricks, together 300 mm. In total 18 flanges for the burners are divided over two opposite sides of the furnace (nine each). In this way, it will be possible to investigate different burner configurations in the furnace. 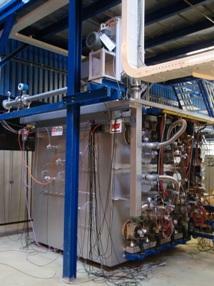 Three burner pairs are installed, each burner pair with a thermal power of 100 kW. The burners were manufactured by WS Warmeprozesstechnik and are of the REGEMAT CD 200 type. Each burner has four combustion air/flue gas nozzles around a central fuel nozzle. They can operate in two different modes; flame or flox mode. In the flame mode the air and fuel are mixing and the mixture is injected through the fuel nozzle only. In flox mode the combustion air is injected through the air/flue gas nozzles. During heating up of the furnace the burners fire in flame mode. Once the furnace temperature exceeds 850 C the burners switch to flox firing mode. Three burners are firing simultaneously, while the other three burner are regenerating. After a typical time interval of 10 seconds they switch and the firing burners start regenerating and vice versa. 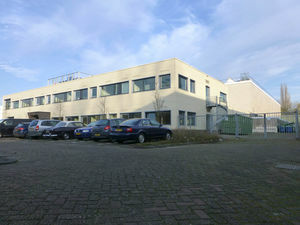 Dutch natural gas is used as the fuel. The burners have ceramic honeycomb heat exchangers incorporated. Eighty percent of the flue gas is sucked by a fan over these honeycombs for regeneration of the heat, while the remaining twenty percent is leaving the furnace via the central stack at the roof. The heat sink is made of eight single ended cooling tubes, four placed above the burners and four beneath. The cooling tubes consist of two concentric annulus tubes. Air is entering in the inner tube, turns at the end and flows back through the outer tube. This setup was chosen to minimize the temperature gradients along the length of the outer tube. Thus, creating an as uniform possible heat extraction distribution. Air was chosen as the cooling medium rather than water, because it with air it is easier to vary the heat extraction and in the case of (small) leakages there will be no damage to the furnace.